Two years ago was the first time I had visited the Village of Ada in Kunigami Okinawa, Japan. This photo was taken in preparation for an article on a ritual known as the Shinugu Matsuri. 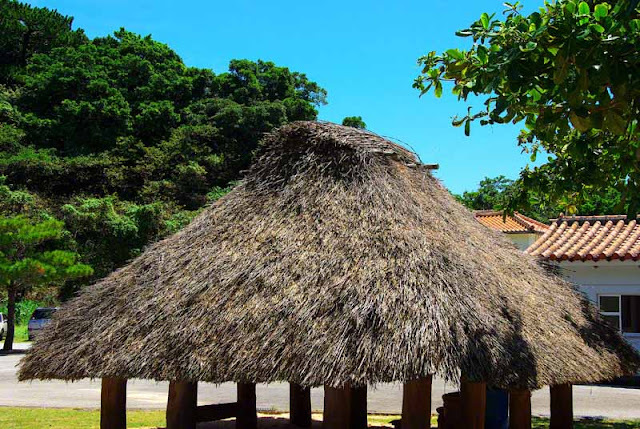 The only thatched roof hut in the Village of Ada, it is where the ceremonies for this festival begin and end. This past week, I visited Ada, again. Making contacts and arrangements to participate in these sort of events is important to me. The Shinugu takes place every year but, only once every two years, certain rituals are performed that the general public may not get to see. Visiting weeks before and going back to visit weeks after, events like this have worked wonders for me and my photography. I was surprised at the warm greetings I recieved, this time around, when I visited the Village Office and I'm chomping at the bit to spend some time with the villagers of Ada, again. This photo will be my weekly submission for LadyExpat's TRAVEL PHOTO THURSDAY. Speaking of festivals, I have been meaning ask if you and your partner in crime (Doc) have been to the ancient castle that was featured in the movie, The Karate Kid 2? I can't remember the name of the festival that had something to do with it, but it sure looked authentic to me. Of course, my mother used to call me gullible...a lot. LOL. there were very few scenes in Karate Kid shot on Okinawa. if I remember right. Maybe Hollywood or some in the Phillipines! But, if the castle was here, we've been to it, many times over. very cool photo - we saw something similar at bunratty folk park, in ireland. i guess thatching on top of stumps is a global phenomenon. Ah, the good old days of recycleable building materials. Does anyone remember them ? Any idea how often the roofs have to redone? Thanks. That's a good question. I'll have to get with the villagers and find out. I'll be there at the end of the month and it'll be something to discuss over a bottle of sake ! Japanese festivals are so interesting to me. Very cool that you've made such good contacts and can enjoy Shinugu Matsuri, too. Gee, when I saw the photo I thought you'd been to Samoa Mike. All their traditional meeting houses are similar style. Yup, there are some unusual festivals over this way, this one, I'd have to say is more of a Ryukyu Ritual than a Japanese Festival but, the word Matsuri does translate as Festival. You'd have to come and see what I do at these events. One track-mind, focus, shoot, move, climb, crawl and sweat. I don't get to see what happened until I download cameras. But, you're right, I enjoy the festivals! Bet if someone did a worldwide study they'd find thatched-roof huts have been used in almost all countries at one time or another. It would be interesting to see how much designs varied, though. Maybe we should get someone to sponsor us and go shoot them all ! Nice shot Mike. This sounds like a very interesting festival. I'll look forward to reading more about it. Thanks for posting to Travel Photo Thursday. Glad to see you back at it. TPThursday is becoming a routine for me.